It sounds a little crazy. But if you think about it, there’s no real reason why breakfast has to be “breakfast food.” Why not mix it up a little with something you’ve never tried? This recipe is a simple way to experiment, because it’s quick enough to throw together on a weekday morning: you can save even more time by hard-boiling a couple of eggs in advance so you don’t have to turn on the stove. And even though it only takes a few minutes to make, the result is a fresh, sunny breakfast absolutely packed with nutrition. Also, don’t be afraid to play around with the ingredients: there’s really no wrong combination when you’re making a salad. Can’t stand tomatoes? Use something else – what about baby carrots, cucumbers, or half an apple? Feeling hungry for more? Throw in another egg or two, or maybe some slices of avocado. Or experiment with substituting spinach, arugula, or other leafy vegetables for the mixed greens. Whatever you use, you’ll be filling up your plate with a meal to beat the toughest of mornings and keep you running on full power until you sit down to lunch. SERVES: 1 PREP: 10 min. COOK: 4 min. In a small saucepan placed over a medium-high heat, bring the water to a gentle simmer and add the rice vinegar. Break the egg into the water, turn off the heat, and cook for about 4 minutes. In a small bowl, combine the olive oil, balsamic vinegar, lemon juice, and salt and pepper to taste. 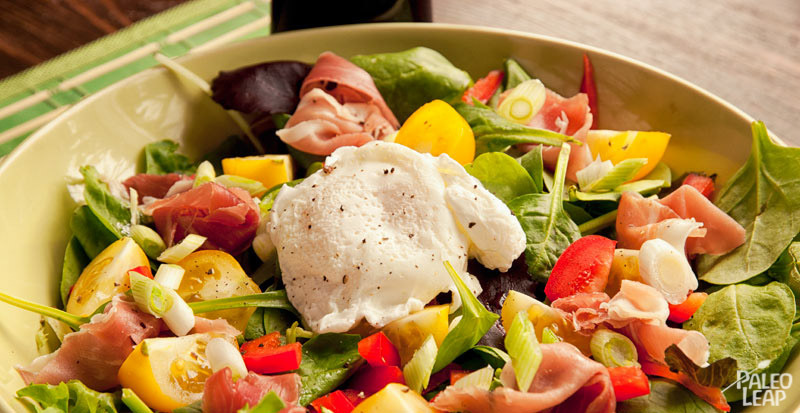 Mix the greens, bell pepper, tomatoes, and prosciutto or bacon in a serving bowl. Add the olive and oil balsamic vinegar to the salad. Add the poached egg on top of the salad and serve.